Every time a child says "I don't believe in fairies, warned Peter Pan , "there is a little fairy somewhere that drops down dead . By her paintings Margaret Tarrant did as much to stop this happenings as J M Barrie did by his writings. 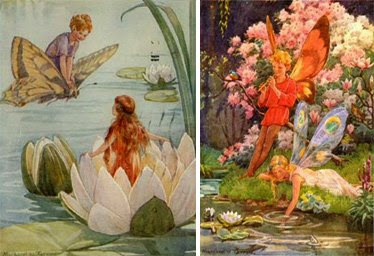 Margaret Tarrant born on 1888 in London was a talented painter that have illustrated many classic stories, along with some fairytale series that i just started reading. I travel into those stories before i sleep and they make my dreams sweet and fairy...Every little picture is an inspiring lovely piece. "...The crowfoot loves the sunshine but rain does not appeal. The raindrops' pitter-patter it does not like to feel. So when the rain is starting , the anxious fairies cry: come quickly undearneath, my dears, and from the rain keep dry! They pull the crowfoot under, and hide it from the rain. Beneath the pond they hold it till sunshine comes again. 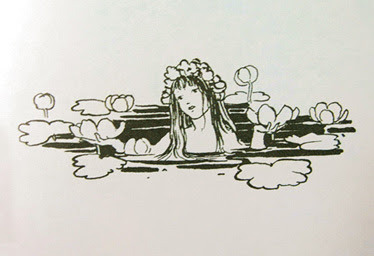 And then they lift it gently, it spread its petals out, and all the little fairies come and dance around about..."
This are some words from the book "The Water Fairies" written by Marion St. John Webb.